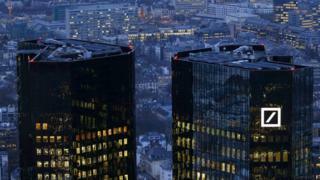 Germany's two biggest lenders, Deutsche Bank and Commerzbank, will hold formal talks about a merger. The announcement caps months of speculation that the two struggling banks would attempt to combine. A merger could result in massive cost savings, in particular by closing branches. But critics say integrating the firms would be complicated and risky. The German government appears to favour a deal. Reports says that German Finance Minister Olaf Scholz has urged the two to consider merging, as he believes Germany needs a national champion in the banking sector. Combined the banks would have one fifth of Germany's High Street banking business and control €1.8 trillion of assets, such as loans and investments. "What is important to me is that we will only pursue options that make economic sense, building on the progress we made in 2018," chief executive Christian Sewing said in a letter to employees. Deutsche Bank has been struggling to generate growth and has been hampered by losses at its US investment banking operations. Commerzbank has also found it difficult to grow. Both banks are facing an economic slowdown in the Eurozone and in Germany where, at the end of last year, the economy narrowly avoided falling into recession. Critics of the tie-up say that combining two struggling banks would just create one large bank with problems. Also, the deal faces opposition from unions who fear that more than 10,000 jobs could be cut if a merger is agreed.